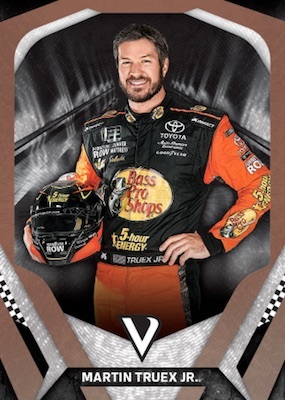 A new competitor on the hobby track, 2018 Panini Victory Lane Racing debuts for NASCAR fans with hard-signed autographs and one hit per pack. The lineup includes holographic cards and options featuring an etched metallic finish. 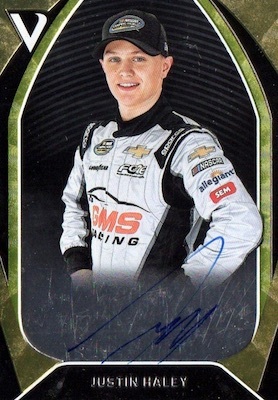 Those buying larger quantities can also expect at least one "Top 6 Driver Autograph" per case. Collectors have several choices that expand the base set, including Silver, Gold (#/99), Red (#/49), Blue (#/25), Green (#/5), and Black (1/1) parallels, plus one-of-one Printing Plates. 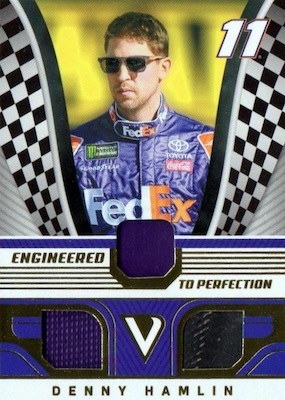 Combining to fall one per pack, inserts take several forms, such as the NASCAR at 70 line that honors 10 of the greats. 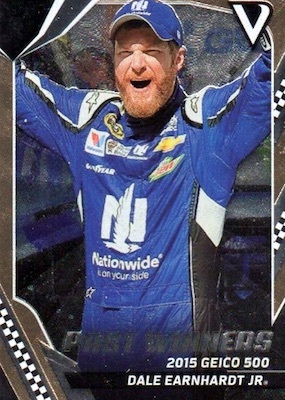 There are also Pedal to the Medal holographic inserts that come one per pack. 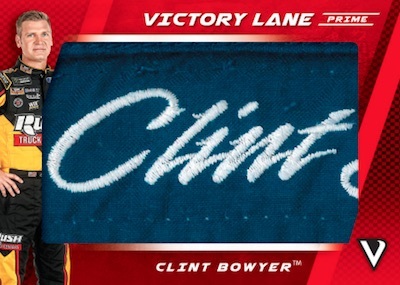 The 2018 Panini Victory Lane Racing checklist shifts into a higher gear with on-card signatures in Octane Autographs and Victory Marks. Both sets feature Gold (#/99 or less) and Black (1/1) parallels, as well. 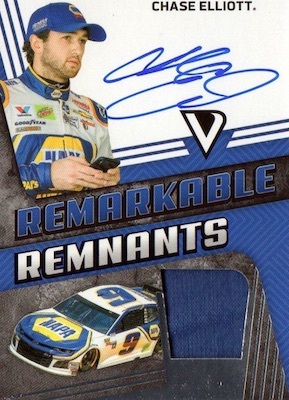 Remarkable Remnants combines race-used memorabilia and hard-signed autographs. 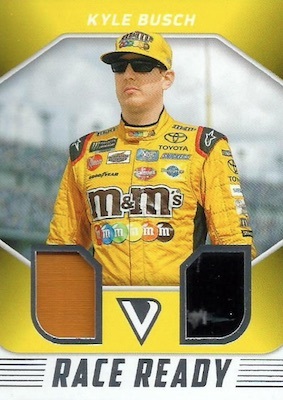 Parallels include Gold (#/199 or less), Green (#/99 or less), Black (#/25 or less), and Laundry Tag (1/1) editions. The unsigned Race Ready Materials and Engineered to Perfection Triple Materials sets match these parallel options. Dedicating the most space to memorabilia, Victory Lane Prime displays Associate Sponsor Patches and Nameplate Patches. 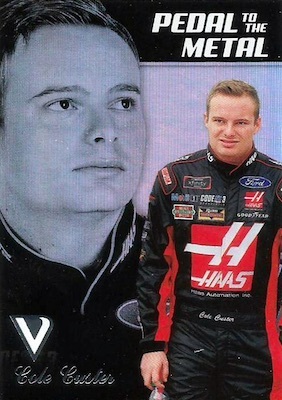 Shop 2018 Panini Victory Lane Racing cards on eBay. PARALLEL CARDS: Silver, Gold #/99, Red #/49, Blue #/25, Green #/5, Black 1/1, Printing Plates 1/1. PARALLEL CARDS: Gold #/99 or less, Black 1/1. PARALLEL CARDS: Gold #/199 or less, Green #/99 or less, Black #/25 or less, Tags 1/1. PARALLEL CARDS: Gold #/199 or less, Black #/25 or less, Tags 1/1. Not all subjects found in Gold/Tag parallels. PARALLEL CARDS: Gold #/199 or less. PARALLEL CARDS: Green #/99 or less, Tags 1/1. Not all subjects found in parallels. 50 cards. Serial numbered #/2 or 1/1. 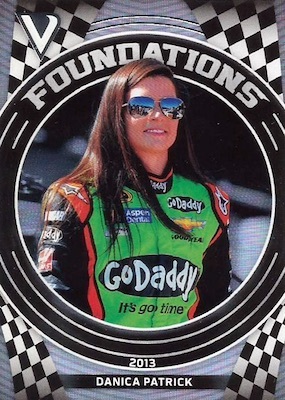 Versions: Goodyear #/2 or 1/1, Nameplate #/2 or 1/1, Associate Sponsor 1/1 (10 versions), Car Manufacturer 1/1, Firesuit Manufacturer 1/1, Goodyear 1/1, NASCAR 1/1, Series Sponsor 1/1, Sunoco 1/1. Not all subjects included in each version. See the spreadsheet at the bottom of the checklist for full details. PARALLEL CARDS: Gold #/99, Red #/49, Blue #/25, Green #/5, Black 1/1, Printing Plates 1/1. PARALLEL CARDS: Blue #/25, Green #/5, Black 1/1. 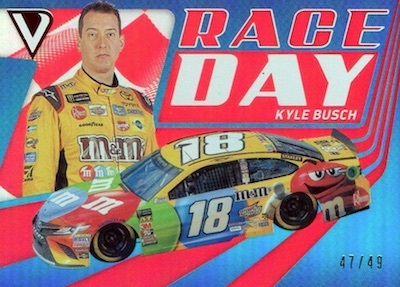 View 2018 Panini Victory Lane Racing NASCAR checklist spreadsheet. Hey Trey, will there be retail for this product? 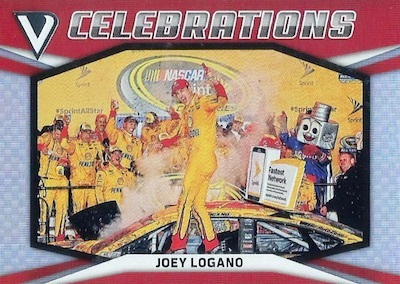 No Ty Majeski only base card of Hailie deegan. Has retail been confirmed yet?